A visit to the Golden Stairs in Pawarenga is a 'must-do' experience while you are in the area. This walk requires a certain amount of fitness, as the 'stairs' take you in giant leaps and bounds to almost 1000m above sea-level. The effort is definitely worthwhile, as your reward will be jaw-droppingly spectacular views on all sides. 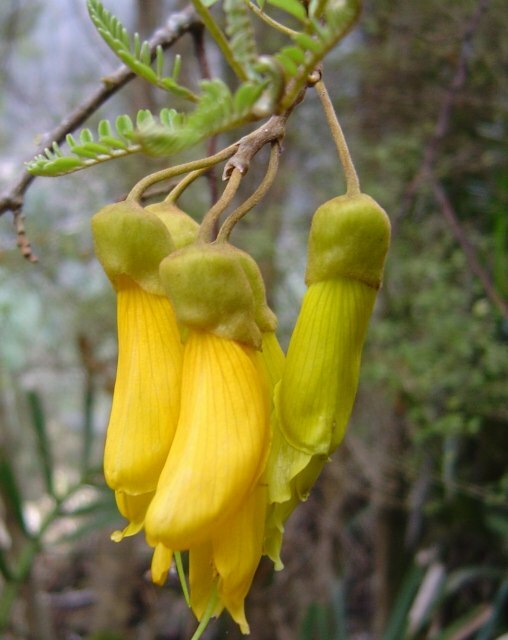 The 'gold' refers to the glorious golden kowhai blooms that glow from the bush-clad hillsides from mid-September to mid-October. But the scenery is stunning at any time of year. If you don't take a camera, you will bitterly regret it later! 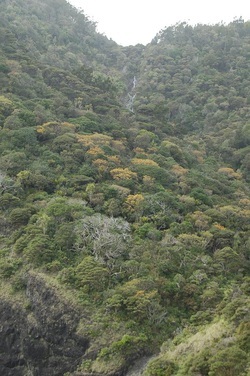 The Golden Stairs are located in Pawarenga, approximately half an hour's drive from K Road Cottage. It is best to plan your walk to begin on an out-going tide, or you could get rather wet at certain spots..
Pawarenga Road comes to an end on the sandy shore of the Whangape Harbour. Drive along the sand, onto the grass and secure your vehicle near Taio Marae. Follow the shoreline down harbour for at least 20 minutes, then watch carefully for the marker where the climb begins. Admire the view from the point where you choose to rest, and return the way you came. The walk shown in the slideshow above took approximately three hours from start to finish, including stops to take photos and enjoy refreshments. To see other aspects of this area, click here to see a slideshow and brief account of a horse trek that we did some years ago from Mitimiti to Pawarenga via Golden Stairs and returning through Warawara forest to Mitimiti - a two-day trek. This is another route that could be walked from either direction or perhaps as a 2 or 3-day round trip. These require a little more planning and co-ordination, because you are going to need someone to collect you at the end of your walk. Walk 1 -Start from Pawarenga, traverse the Golden Stairs and descend to the coast. Walk southwards for almost six kilometres along the beach until you reach Mitimiti (where West Coast Road begins). Walk 2 -Start from Mitimiti, walk north along beach to Whangape Heads, ascend and traverse the Golden Stairs, and arrive at Pawarenga. These walks take from four to six hours, depending on a number of factors, mainly the general fitness of the participants. -We can drive you to the start of your walk and collect you at the end. -We offer safe parking for your vehicle on our property whether you have booked the cottage or not. -We may be able to assist you in other ways - please ask! This is definitely one of the most amazing day walks in Northland (if not one of the most iconic in NZ) - Huge fiord-like deep sound of a long narrow harbour valley cutting its way through to the pounding Tasman sea. This links to the remote and secrete northern most part of the wild Mitimiti Beach. 3 hours of walk on ridge one way from Pawarenga end of the Whangape Harbour at low tide, and then another 1-2 hours stroll on beach towards Mitimiti to meet our most wonderful hosts Jill and Tiny (they dropped us off at Pawarenga earlier and picked up from north end of Mitimiti beach). The name Golden Stairs Walk comes from the blaze of Kowhai flower display in the valley in Spring time - it looks like God painted the mountains with gold splashes!! The view is something you have never seen before - jaw-dropping! The best place to stay is of course at Jill and Tiny's K'rd Cottage at Panguru, North Hokianga Harbour. Their place is absolutely straight from a Tourism New Zealand brochure and they are the most wonderful people you will ever meet! PS - 4WD is considered most appropriate way of getting to the cottage as there is a ford in the middle of their driveway - a classic kiwiana that gold can't buy!!! There is a beautiful waterfall in their backyard forest (part of Warawara Forest) which takes hours of fun to explore.